Now all four colors are between $388-389. If you are thinking about purchasing, I would do it quickly, as there aren't many left in stock for all colors. Sony has tried more than once to wedge themselves into the North American smartphone market, but often to no avail. 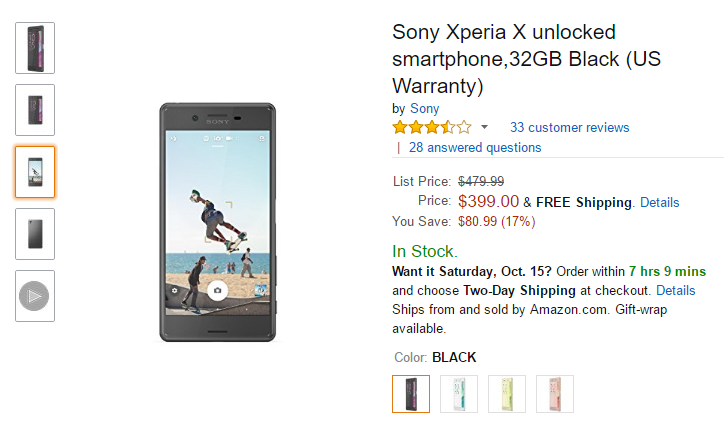 Perhaps in an effort to clear stock for their recently-released Xperia XZ and X Compact, Sony is now offering the Xperia X for $399 on Amazon. Even at that price, I'm not sure I would recommend this phone. If you read our review of the device, you'll know that it didn't impress us. While the display, front-facing speakers, and battery life are excellent, it is not water resistant, lacks a fingerprint sensor, and has a lackluster camera. The phone is powered by a Snapdragon 650 CPU with 3GB of RAM, and has 32GB of internal storage with a microSD card slot. If you really, really want an Xperia X, this is the best price we have seen it at. The black color is $399, the Lime Gold is $422, and White and Rose Gold are $424.